With a dream-catcher hanging off the centered microphone stand, a drum kit strategically placed at the front of the stage and a logo with a hand reaching out hung from behind, DREAMERS recent Chicago show was not your typical performance. The Los Angeles-based rock band, formed in 2014, have played anywhere from hole-in-the-wall bars to massive summer festivals and arenas, but it is a happy in-between that they find themselves in to start their 2018. 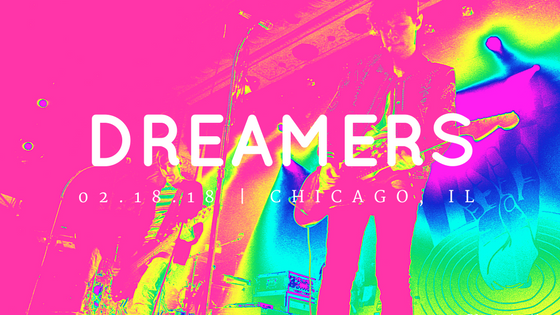 Playing alongside New Politics for the Lost in Translation tour, DREAMERS brought their ‘A’ game to Chicago with songs from their debut LP, This Album Does Not Exist, and songs from their upcoming release, to be announced. Most cases for opening acts involve a sense of having to prove themselves as they amp up the crowd before the headliner – which was not the case for this show. The audience was equally delighted to see the trio step out onto the stage and begin the opening notes of “Wolves (You Got Me)”. The band came out to a pre-recording of Alan Watts, British philosopher, who spoke of the dream of life: simply meaning that life is what those make of it. One could dream for a night and only dream of fulfilling wishes, or one could let go of control of dreams and push boundaries until the dream mirrors the present. "You would dream the dream of living the life that you are actually living today." Guitarist Nick Wold, bassist Marc Nelson and drummer Jacob Wick all contributed vocals throughout the night, adding harmonies to Wold’s main vocals and giving each song an effortless approach. It’s a sound that will transport you to different genres that make up their influences, including Weezer and The Cranberries. Their set list also included "Last Love Song", "Bleed Through", "Karma" and "Painkiller" as well as their cover of "Zombie" and popular singles "Drugs" and "Sweet Disaster". Chicago has great meaning to them, as the city is one of the first that played them on the radio and Lollapalooza was one of their first major music festivals. This Chicago performance was no exception to their thunderous live shows. It was a performance that glowed not just in fluorescent lighting but in musical and lyrical talent. While DREAMERS gears up for their second full-length album, Chicago will be gearing up for their return.